If you followed my instagram account of Tokyo whilst I was away, you will have noticed I sported some bright pink khaki shorts. Now pink is one of my favourite colours, but I'm pretty careful (well most of the time) about not overdoing it and wearing it too much, so much so that it is all 'in your face'! But those shorts were just too comfy to pass (and I also didn't think bright fluro green or orange really suited my skintone). I'm living on a summer fashion high in my head at the mo, we shopped quite a bit whilst we were in Tokyo, but know that I can't pull out most of the items out to wear, until AT LEAST August or September. That's unless Sydney decides to freak it and bring on some warmer temps this weekend.... pretty please? Anyways, with those shorts in mind, this week's Food & Fashion's post is dedicated to pops of the colour pink! 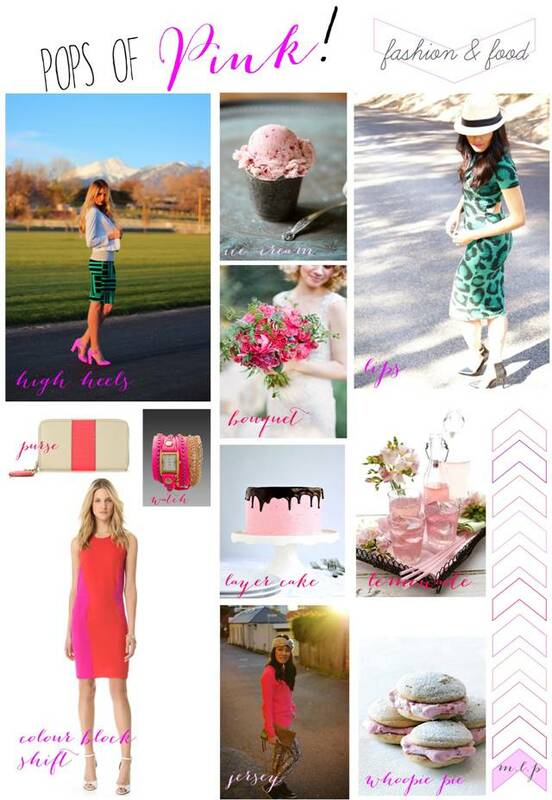 Matching subdued tones with pops of pink! It's nearly Friday... I can't wait!